Western Center Academy (WCA) (Hemet, CA). Given its location, WCA’s central goal is to integrate a “museum discovery” based approach with formal educational methods. 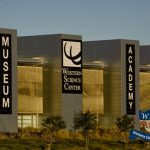 The school is located on the site of the Western Science Center that has a large collection of Native American artifacts and Ice Age fossils. The Museum Discovery approach includes experiential, participatory activities with real specimens. It often takes the form of technology-infused, project-based learning in small groups. Museum Learning models how adults learn by researching, discussing with colleagues, and communicating conclusions. For example, students: may dig up artifacts in the simulated archaeology/paleontology dig site; or become detectives using forensic examination to solve simulated crimes. Classrooms are set up to facilitate group work and project-based learning with wheeled tables that can be easily changed or grouped together. Middle school students study core subjects in the morning and in the afternoon have STEM classes (e.g., robotics, aquatic engineering, archaeology, or programming). Students rotate though a lab every 9 weeks and experience 12 courses during their middle school years. These engaging methodologies contribute to increased student attendance, improved morale, and greater completion of classwork and homework.